The 4-9 favourite came from off a crawling pace to readily account for Karezak by three lengths. In doing so, Peace And Co consolidated his position as ante-post favourite for the Triumph Hurdle at the Cheltenham Festival in March. Trainer Nicky Henderson said: "We had to try to get him to settle, but that was a fair mess of a race - they went no gallop at all. "It would have done him good as it's the first time he's had any horses in front of him. 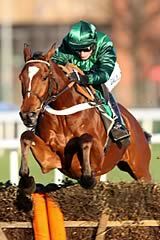 "You wouldn't run him again (before the Cheltenham Festival). "He'll go straight there now." Ibis Du Rheu and Zarib jousted for the lead for most of the race, but the pace was unsatisfactory from the outset. Peace And Co was desperate to get on with it under Barry Geraghty, but last month's facile Doncaster winner was only given the freedom to express himself up the home straight. A crisp leap at the last gave Geraghty's partner a narrow advantage and while Karezak again showed plenty of resolution, he was comprehensively beaten.